Doggy paddle, The most ancient of all swimming strokes. It was the first swimming stroke used by ancient humans, learned by observing animals swim. Maybe Aesop, the Ancient Greek story-teller was watching a dog swimming when he wrote the fable, “The Dog and its Reflection”. He was however more interested in the nature of the dog rather than its swimming abilities! It is a moral about being content with what you have. “The Dog and its Reflection” is a warning that he that covets often will lose it all. Dogs are greedy and live in the moment and in Aesop’s fable a dog has stolen bone and it making off with it. He crosses a river and sees his own reflection in the water. Thinking it is another dog carrying a bigger bone, he opens his mouth to bark and loses his bone. Infact Aesop wrote a number of fables about dogs. He tends, in my mind to give them a bit of hard time. He outlines characteristics, that shows them in a poor light. For example, he illustrates their stupidity and greediness as a negative. We in the modern world may perhaps look upon these characteristics as playfulness and tenaciousness! He portrays the dog as enslaved in “The Dog and the Wolf”, but ask any dog owner and they would probably say the reverse is true! Maybe in ancient Greece things were different. However there is truth in Aesop’s fables, and his particular use of a particular animal in a particular fable is part of their incisive message. Although Aesop’s fables were written 2500 years ago they still pack a punch. “The Dog and the Wolf” is about freedom. A starving wolf meets a well fed dog and comments upon how well the dog looks. The dog thanks him for the compliment and tells the wolf about his comfortable life and suggests the wolf comes and joins him. The wolf, sick to the back teeth of hardship and worrying about where his next meal is coming from agrees to join the dog. However, the wolf notices that the dog has some fur missing round his neck and asks the dog about the bald patch. The dog tells the wolf it is where his master puts on his collar and chains him up at night. The wolf is appalled that the dog has traded his freedom for a full belly and immediately leaves. Have you ever been described as a dog in a manger? I hope not. This is another of Aesop’s fables where the dogs reputation come out poorly. This one is about spite. There was a dog lying in a manger who did not eat the grain but who nevertheless prevented the horse from being able to eat anything either. Know anyone like this? Someone who keeps something that they do not really want in order to prevent anyone else from having it. A lot of two year olds have this habit! But hopefully they will grow out of it! 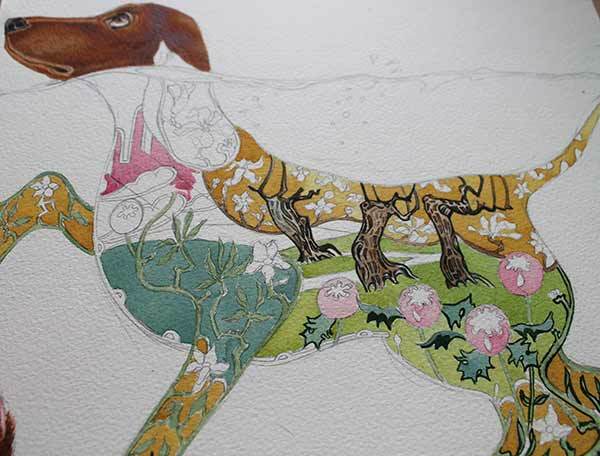 This is the watercolour in progress, as you can see Rose Madder Genuine and Quindercrome Gold feature! I am such a fan of these two colours! I have noticed a peculiar thing! All the dogs I draw tend to have a slight comic element that the other creatures i paint don’t have! This must be an unconscious thing! 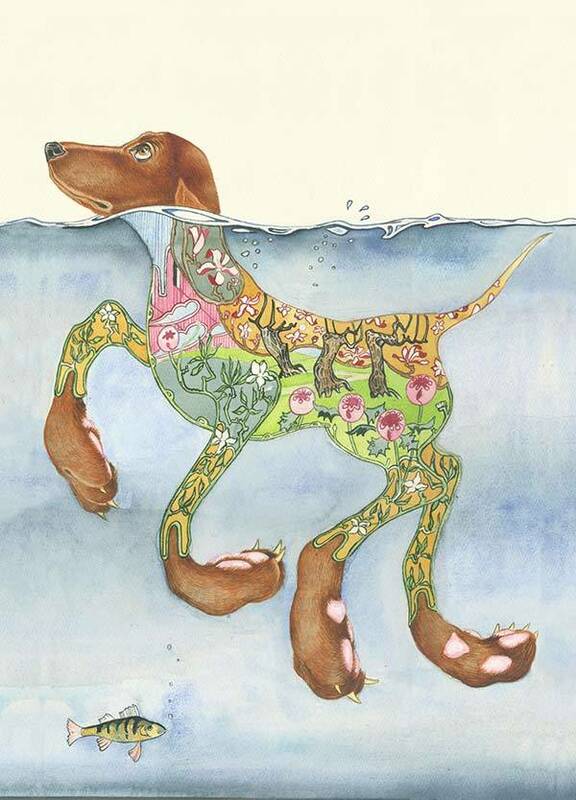 See the whole range of Dog cards Cards and prints at The DM Collection.